I had the chance to go see the new rooms 2-7 which reopened at the Uffizi Gallery last week and I have to say the museum has done a wonderful job. First, we have to recognize that the decision to close several rooms at a time is not easy, it does cause many mumblings and grumblings from people who arrive and find rooms they were interested in visiting closed. Where possible, main works of art are moved and remain temporarily visible during renovation work but not all “fit” into those rooms. The alternative is closing the entire museum to finish renovations quicker but for Italy and Florence, this is really not even a thinkable possibility! During the last 9 months, the three “majesties” in Hall 2 by Giotto, Cimabue and Duccio da Buoninsegna and the “Incoronation of the Virgin” by Lorenzo di Monaco in Hall 6 were not moved at all. An entire protective structure with a special air system was built around each of the four works of art which helped monitor their state while works were carried out all around them. New lighting and air conditioning systems were installed, with sun roofs all getting new unbreakable panes and modern technology to better control both natural and artificial lighting. Many of the works of art benefit from being seen in natural light, I really appreciated seeing again many works with the new lighting, as two main works with a green background which makes them stand out more. 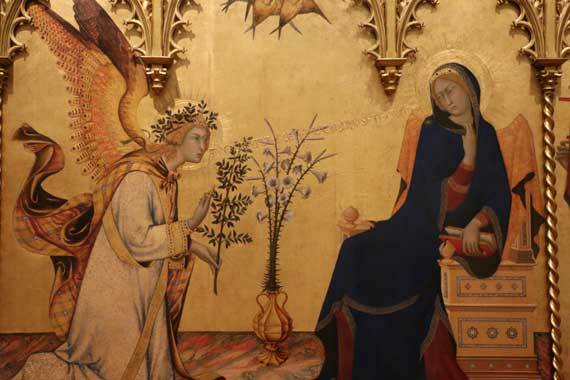 Close up of Simone Martini’s and Lippo Memmi’s “Annunciation and Saints”, 1333, in Hall 3 – Hall of the 14th century. Another feature of the reopened halls: Hall 1 opened last year and many works from Hall 2 were moved there, which essentially freed up lots of wall space. 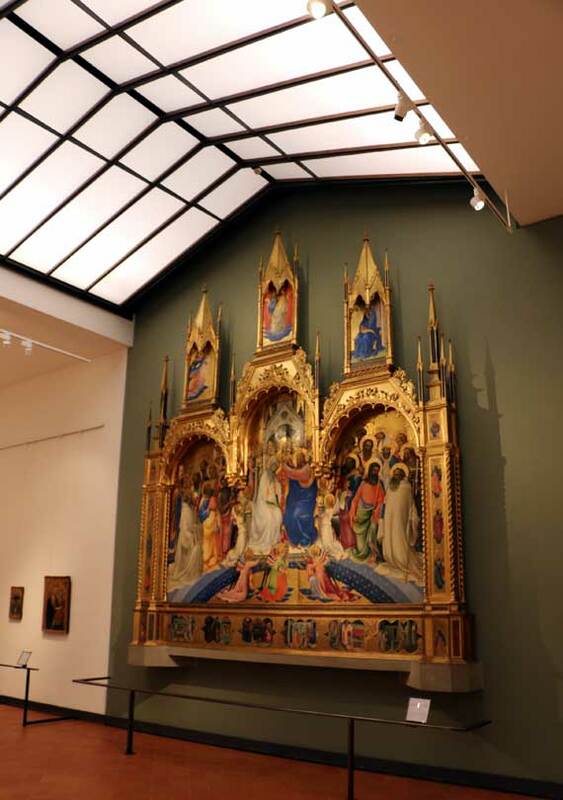 The new rooms now have on exhibit 14 “new” works of art – keep in mind, not really new since they are all works from the same time period as the rest of the works housed here (from the 1250s through the 1440s). Hall of the 14th century in Florence. One of the biggest changes to note is that the works of art that were in Hall 5-6 (International Gothic) have now also spread out into Hall 7. 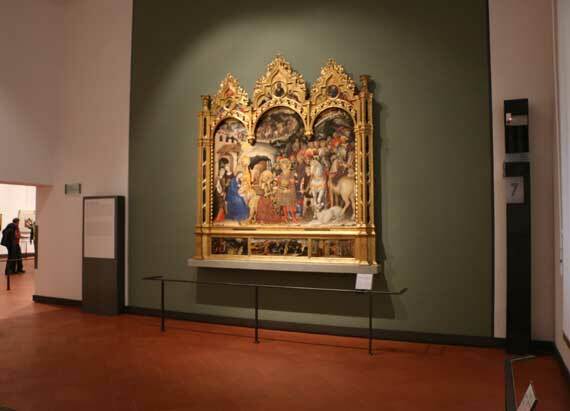 Hall 7 is now dedicated to Gentile da Fabriano which has two of his works, the main one being the “Adoration of the Magi”. 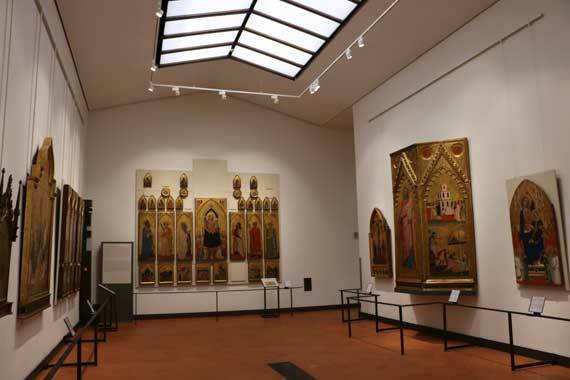 Both were in the previous hall, which is now completely dedicated to Lorenzo di Monaco and to other works by religious painters. Here, Monaco’s “Incoronation of the Virgin” is now center stage to your right as you enter the hall. Hall 5-6 dedicated to Lorenzo di Monaco. Here is his “Incoronation of the Virgin”. Whether you love the early “primitives” as the artists of these halls are called or whether you are admiring them for the the first time, take your time to visit these first few rooms so that you can appreciate the evolution of our history of representing our beliefs and ideals through art evolved over centuries in Italy. The photos here are a preview, we invite you to go visit the Uffizi Gallery during your time in Florence! If during the summer, I highly recommend you pre-book your tickets on Uffizi.org. Gentile da Fabriano’s “Adoration of the Magi” in the new Hall 7. Next on the renovation schedule are the halls that include the Botticellis…. now those are huge, I wonder whether it will be possible for them to remain visible during the closing of the rooms (which is foreseen for 2016). 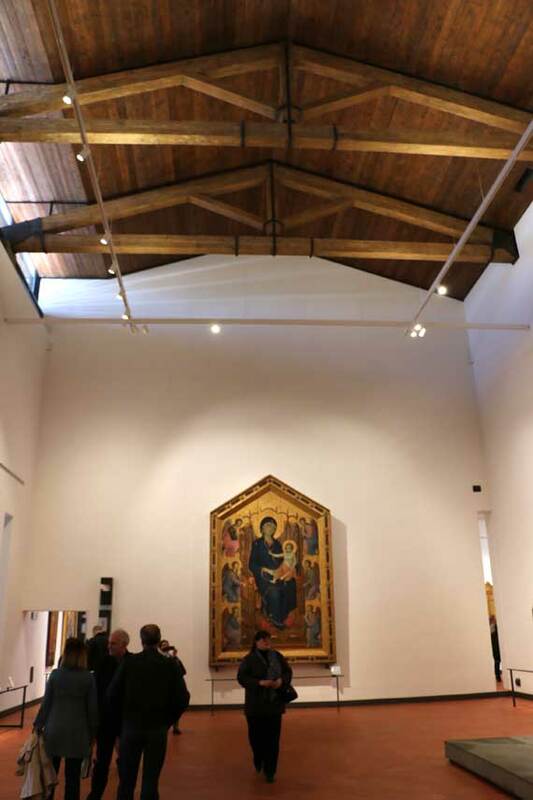 One of the 14 “new” works to be added to these rooms is Nicola di Guardiagrele’s “Madonna of Humility”, the only known work by this artist from the first half of the 15th century. That veil is incredible!